Another political ambassador has called it quits. The U.S. Ambassador to The Netherlands, Fay Hartog Levin announced that she will be stepping down next month as chief of mission of the US Embassy in The Hague. 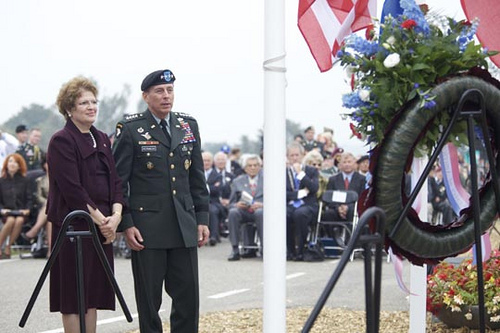 September 20, 2009 – Ambassador Hartog Levin and General Petraeus at the wreath laying ceremony at the Waalcrossing Monument. Photo: Gemeente Nijmegen. It is with the deepest regret that I have informed President Obama that I will be stepping down as United States Ambassador to The Netherlands in September. The great honor of being selected by the President and confirmed by the Senate to represent my country and its people to the Netherlands has only been matched by the warmth and hospitality the Dutch people have shown my husband and me since the day of our arrival. To be American Ambassador anywhere is an honor. To be Ambassador to the country of my parents’ birth is a unique privilege. The thousands of Dutch men and women I have met from all walks of life who have welcomed me and supported my work have made me even prouder of that heritage. At this time, however, I feel the need to turn more of my attention to my family and to serving the public interest closer to my home in Chicago. I thank the President for granting me the opportunity of a lifetime, and Secretary Clinton for her inspiring leadership. Special thanks to Prime Ministers Rutte and Balkenende, Deputy Prime Minister Verhagen and Foreign Minister Rosenthal with whom I have had the good fortune to work as well as with the many other officials throughout the Dutch government who are committed to maintaining and strengthening the bonds between our two nations. I also want to thank my entire Mission staff without whom none of what we have accomplished together would have been possible. I know I leave the U.S.-Dutch partnership – one of the strongest and closest we have with any nation – in good hands for the future. The non-career Ambassador brings strong political instincts, high energy, a talent for public engagement, and personal warmth. Her legal background fits nicely in The Hague, which she has described as “at the center of the rule of law and the search for peace.” Her style and priorities blend well with those of the DCM, a career political officer. In her first year the Ambassador focused on public outreach and representation, while the DCM oversaw mission management, reporting, and policy advocacy. This division of labor was appropriate. Both the Ambassador and the DCM described poor mission morale as their first priority when they arrived in The Hague. From the team’s discussions and observations of the Ambassador and DCM in interaction with American and local employees, the OIG team is convinced that a major improvement in mission morale has taken place since the arrival of this executive team. Both were instrumental in giving the final push to a Foreign Service national employee pension plan, which corrected a long-standing issue. Both have also used social events and participation in staff activities to establish a sense of community. Steady progress is being seen. Below is a video on the life of the Ambassador Hartog Levin. Students of Pace University’s Department of Media, Communications and Visual Arts shot the documentary while on Spring Break 2010. The President Obama took the opportunity today [August 1, 2011] to consult with U.S. Ambassador to Syria Robert Ford, who is in Washington D.C. for meetings with the Senate and key Administration officials. The President thanked Ambassador Ford for his extraordinary service to the American people at a very challenging time in Syria. The President also reiterated his strong condemnation of the Syrian regime’s outrageous use of violence against its own people, and reaffirmed America’s support for the courageous Syrian people, and their demands for universal rights and a democratic transition. 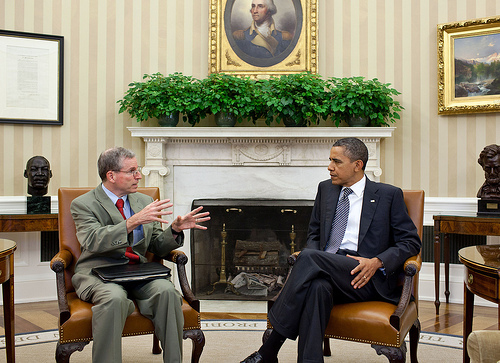 in the Oval Office, Aug. 1, 2011.